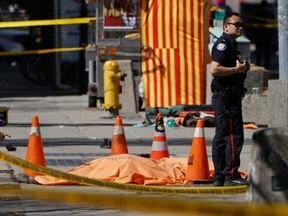 Toronto van attack Hoax. Numerology and Gematria fun. Female freemasons. The van of the attacker with 33 on the licence plate, and 33 also on the police car behind the witnesses (crisis actors) being interviewed. 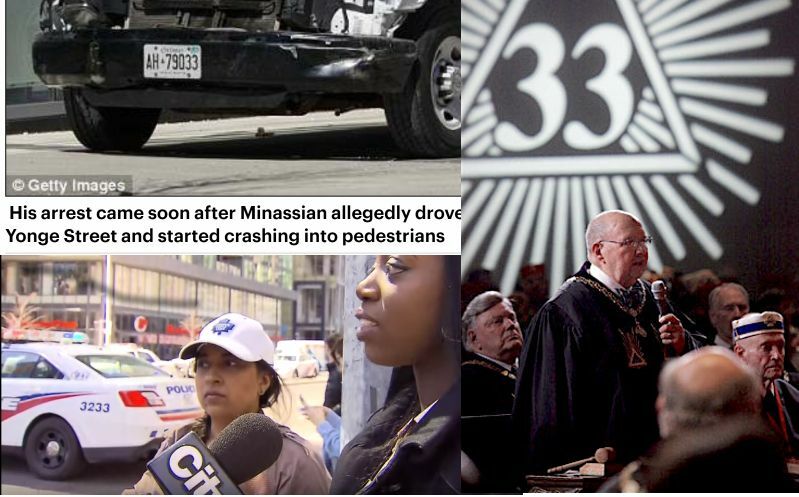 33 the highest degree of Freemasonry and the number of Illumination. As always some Orange as it is the only colour that is 33 in Numerology. Not only the Orange blanket (it's not even a body bag), but also the Orange kiosk and the Orange cones. The only point of this picture it is to scream "Orange!" to those in the know. As even the TV series Knightfall will tell you (episode 4), Orange is what the Brotherhood Of Light (aka Freemasonry) use to signal to each other. Interesting this numerology game by the Daily Mail! As famously worn by Prince William. Of course the Royal Family have a strong connection to the Freemasons, with one of their family always placed as head of the United Grand Lodge of England (currently the Duke of Kent). There's also the goat on the patch worn by Prince William. Freemasons are jokingly called "goat riders". And the Toronto attack van had "Ryders" written on it....probably coincidence but worth a mention. 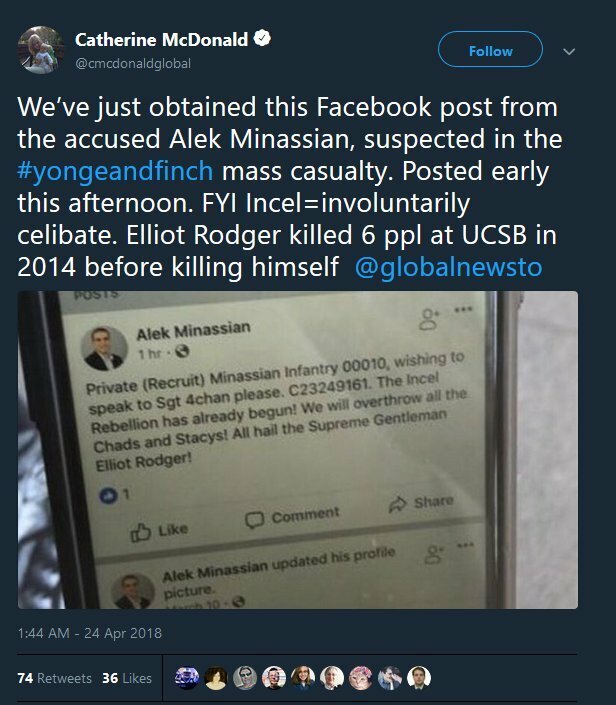 We are told the attacker was part of a 4chan "Incel" group. Incel are supposedly an online group of celibate geeks/trolls accused of misogyny and sexism, which feminists have been trying to shut down. 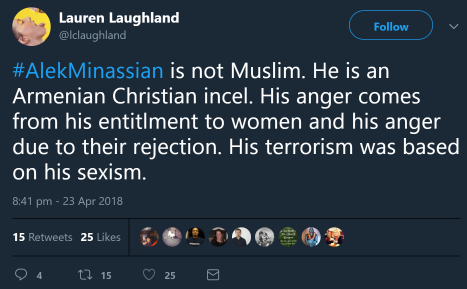 The attacker was "inspired by Elliot Rogers", another misogynist fake terrorist. Yet another category of people to add to the State's list of "potential terrorists" to spy on and persecute for wrong think. All part of Justin Trudeu's politically correct feminazi Tyranny being established in Canada. 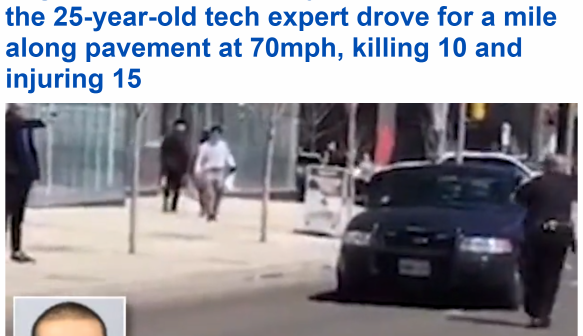 Propaganda to police thought and to enforce dystopian like censorship, as well as making driverless cars compulsory by 2030 (that's the underlying agenda behind all the van/car attacks). "But Freemasons are an all male club". Nah, they've had female lodges for centuries. 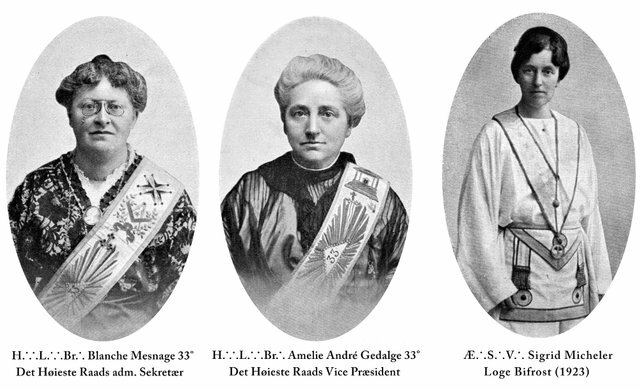 Here some 33 degree female masons. Also the women currently in position of power just so happen to be freemasons, there because they're part of the club and sworn to the masonic Oath of Secrecy and Obedience. 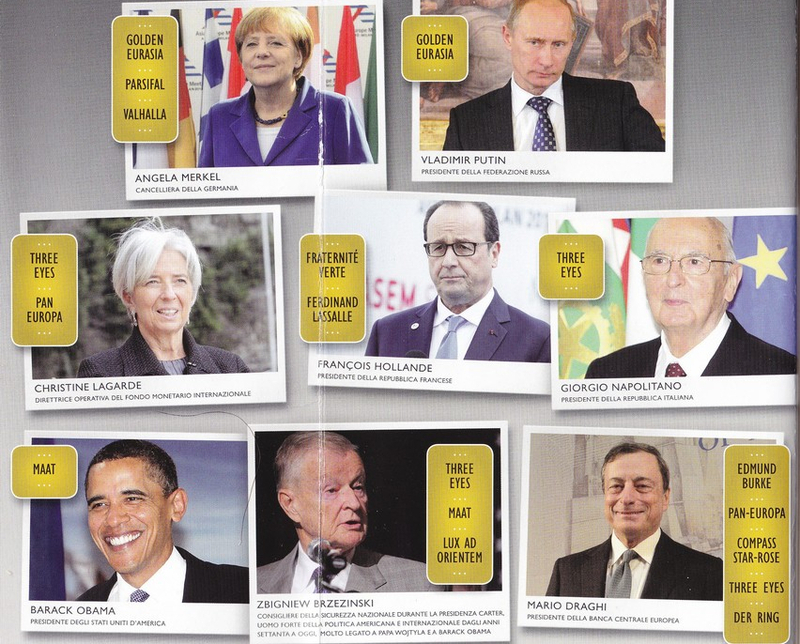 Merkel is a member of the following UR Freemason Lodges: Golden Eurasia (same as Putin), Valhalla, Parsifal. Lagarde is a member of : Three Eyes, Pan-Europa. Image taken from the book Masons by Gioele Magaldi, former Grand Master of the Grand'Orient of Italy. Huhhh, so much info!! I don't know anything about Freemasons. This research reminds me of the Da Vinci Code. Do you think that this book holds any value in front of reality? Is it exposing truths or misleading? The DaVinci Code is good fiction with some truths, takes a lot from The Holy Blood and the Holy Grail which is in my opinion a more historically accurate book....though I believe that ain't the full story either. The best book on Freemasonry is Masons by Gioele Magaldi, though it isn't a fun read it is filled with real info. Magaldi is a Mason so he's biased, but he admits many Freemason lodges turned tyrannical, corrupt and evil in this last century. several dreadful crisis actors in this event. This dude Ali Shaker....what a lying fraud!